Makoto meets a sweet, shy girl named Haruna helping out at the school's athletics festival. He confesses his feelings for her the next time he sees her, and she bluntly rejects him, only to call him later and ask him out herself! The source of all these mixed signals is Haruna's "evil" twin sister, Natsumi. Natsumi is the opposite of Haruna, she's a forward, crude girl bent on taking whatever she can from her twin sister. Makoto is stuck in between Haruna and Natsumi, as they viciously fight over who will win him in the end. Izumo is a girl who fights magical "artifacts" and their evil wielders with her own magical sword. However, she's really socially awkward and has a hard time talking to people. Mostly she just finds herself able to speak with tools and the souls of magical tools, including the cheerful and extremely extroverted human form of her sword's soul. Will she be able to learn that there are some people worth making the effort to talk with? A young woman is taking a bath when in drops a tiny old man! He proclaims himself a fairy, and says that she can see him because she's troubled in some way. Will he be able to solve her troubles? Shion's world is torn apart when she is forced to flee her invaded home, leaving behind her father, mother, and little brother, and face the fact that some people she had known all her life had betrayed her. Now, armed with all the knowledge and skills her parents and teachers have given her, she must find the other 6 people who carry portions of her father's secret. The world is full of mysteries! The DMR (Dragon Mystery Reportage) is a group of people from different backgrounds that try to solve a few of them. They might all have different theories, based on science, conspiracy theories, occultism, or extraterrestrials, but they are all searching for the truth! Ishikawa Takuya, a high school student who doesn't stand out in any particular way, is surprised when his principal asks him to take care of some transfer students. He is even more surprised to find that there are actually 30 charming female transfer students in his care, who have come from a boarding school that was destroyed in a fire! At first it seems like a dream come true, but then he notices their knives... and guns... What kind of school did these girls come from? Part two of this and I found Itsuka Tenma no Kuro Usagi and Tomorrows interesting. 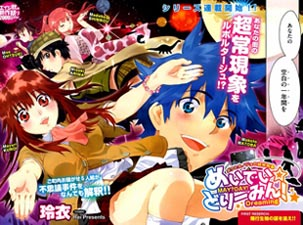 A mysterious girl vampire and a shounen about kids with powers in hiding sounds good~ I hope both get scanlated/translated. What do you guys/girls find interesting? Oh and Ability Shop got scanlated from last week so go check it out. Edit: Karasu got scanlated as well (and translated by tethysdust, no less). I found the story in Tomorrows the most interesting out of these, but I love those sorts of x-men/heroes type plots. Haru to Natsu was fun, I think its worth checking out for anyone into silly romantic comedies. Already been read Tommorow, and its pretty good. happy to see Ability Shop got scanned. can't read Kanji, so i normally skip seinen, but seems like Itsuka is readable, so i'll try that. I like 1, 2, 3, 5, 6, 7, and the 8th. For some reason I look forward to "Between Haru and Natsu, I am..."
EDIT: Plus Hakui no Kanojo. 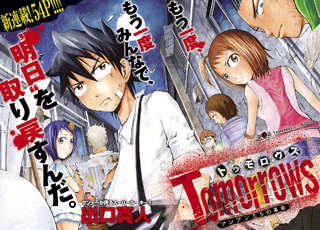 I hope someone starts scanlating Itsuka Tenma no Kuro-Usagi and Tomorrows as soon as possible because their stories look very interessing. 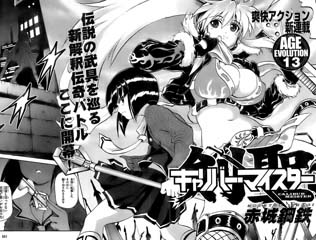 Kunoichi Mahouden looks moderately interesting.